BECKHOFF Automation offers a wide selection of fieldbus interfaces designed for open control technology. The CX5000 embedded PC series with its robust and compact magnesium housing offers a wide range of communication options through integrated I/O and system interfaces. Optional master/slave fieldbus and communication interfaces enable flexible integration in subordinate or higher-level systems. The dynamic control system can be operated within an extended temperature range of -25ºC to +60ºC. 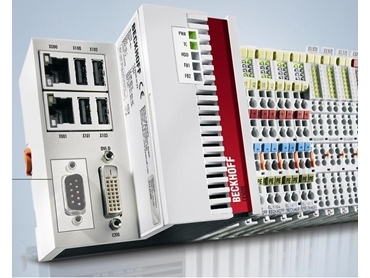 Offering the user an exceptional assortment of connectivity solutions, the CX5000 embedded PCs from Beckhoff feature a variety of system interfaces including 2 x Gigabit-Ethernet, 4 x USB and 1 x DVI-D as well as a direct I/O interface for Beckhoff bus terminals and EtherCAT terminals. The EtherCAT I/O system enables simple integration of unlimited fieldbus devices via communication terminals that range from PROFINET to IO link. Alternatively, fieldbus integration is also possible via the CX5000 embedded PC.